Stoked to play this in my Journey to Eternity deck. 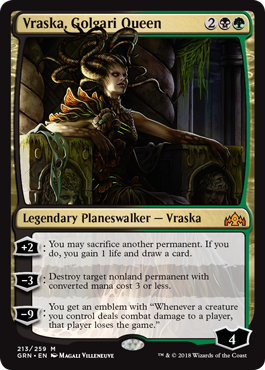 Vraska has more mechanical identity than any other planeswalker; Jace and friends are just "random on-color abilities" but a Vraska card actually feels like Vraska. Sarkhan is good, too, I guess. Gideon is pretty consistently a creature. Alright, Gideon gets a pass too. I feel like if you removed the name and art from most planeswalker cards, you'd have no way of knowing what character the card was supposed to represent. I mean, you could probably see it's a blue planeswalker and guess Jace and be right 90% of the time, but not for the right reason... y'know? It's nice there are some PWers with actual flavor for their abilities and not just "Alright do the things this color does". So, you could opt to NOT sack a creature, in which case you get 2 loyalty counters and no effect? It's that way so you can activate it with no creatures out, but yeah I guess you could do it with stuff out and just get no benefit besides a hearty uptick.